Salt Lake City, Utah – September 15, 2015 – Monnit Corporation (www.monnit.com) a leading provider of wireless sensing and monitoring solutions, today announced a partnership with Devicify, the leading Internet of Things (IoT) Management application on the Salesforce™ platform, with the joint solution on display at Dreamforce 2015 in San Francisco, CA. Devicify Connected Products Management™ is an IoT management suite designed to enable businesses to plan, design, deploy, manage and monetize connected products. With Devicify CPM, companies can connect Monnit sensors and iMonnit™ to their business applications and leverage the power of the Internet of Things to manage and control deployed assets across, and through, business processes. Monnit wireless sensors monitor various functions critical to business operation, including temperature, humidity, access, motion, water, light, voltage, vibration and much more. The sensors connect to the iMonnit online monitoring system via gateways designed to work with Devicify CPM. Devicify customers now have access to a complete wireless sensing and monitoring solution, designed to increase productivity and maintain business operations, helping to ensure operational efficiency while increasing on-the-job safety. Monnit is a leader in the design and manufacturing of low cost wireless sensor solutions targeted at the commercial, industrial and consumer markets. Monnit’s sensing solutions are designed to be easily installed and used by anyone wanting to remotely monitor information and activities, including: temperature, access, presence of water, light, humidity, and vibration in or around structures, machinery, and various environments. For more information on Monnit products and services visit www.monnit.com. Devicify™ enables companies to generate a Return on Connectivity™ by seamlessly connecting deployed products with the business operations of the enterprise. Delivered on the Salesforce™ platform with included ThingWorx™ development tools, Devicify CPM is the application Salesforce customers choose to rapidly implement a future-proof IoT strategy. For more information, please visit Devicify’s booth N1943 at Dreamforce Sept 15 – 18, 2015 in San Francisco, CA or http://www.devicify.net. Monnit and iMonnit are trademarks of Monnit Corporation. Devicify, Connected Products Management and Return on Connectivity are trademarks of Devicify. Salesforce and Dreamforce are among the trademarks of salesforce.com, Inc. ThingWorx is a trademark of PTC, Inc.
Salt Lake City, Utah – September 3, 2015 – Monnit Corporation (www.monnit.com) today, announced the release of a new multi-probe wireless temperature sensor. 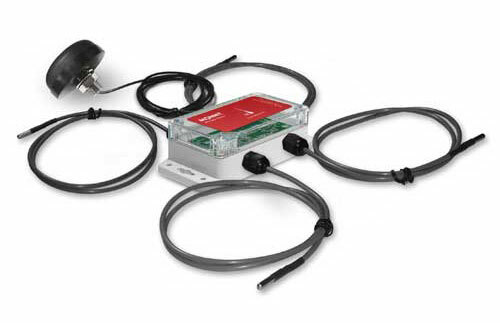 Monnit wireless quad temperature sensors feature four (4) independent temperature probes to measure and track multiple temperatures with one device. This new sensor will be especially beneficial in HVAC, facility and data center monitoring applications. For example, one quad temperature sensor can provide a complete preventive maintenance system for HVAC applications by monitoring the input and output temperatures of air handling systems to ensure proper operation and send notifications if maintenance is needed. Sensor data is stored in the iMonnit Online Sensor Monitoring and Notification System and can be reviewed and exported as needed from any web enabled device, such as computers, tablets or smart phones. User customization allows you to set notifications and alerts from the system so you can know immediately if temperatures are above or below an optimal range. – Accurate to ± 1° C (± 1.8°F). – Increased accuracy by user calibration to ± 0.25° C (± 0.45° F). – Probe temperature range of -40°C to +125°C (-40°F to +257°F). – Free iMonnit basic online wireless sensor monitoring and notification system to configure sensors, view data and set alerts via SMS text and email. Focused on simplicity, Monnit wireless sensors can be setup, gathering data and notifying users of concerns in just a few short minutes. Monnit currently provides over 48 unique wireless sensor types for measuring temperature, humidity, door and window (open/close), motion, water, activity, dry contact and a variety of other conditions that are critical to businesses. Monnit also provides wireless sensors to OEM’s and Reseller’s through a business partner program (www.monnit.com/partner), which allows for white labeling (private branding) of both the wireless sensor hardware and the online monitoring software. For more information on Monnit products and services visit www.monnit.com. Monnit CEO, Brad Walters was recently interviewd by Rich Nass from Embedded Computing Design. In the interview they discuss the “Internet of Things” and Monnit. « View the entire 5 minute interview here.